Easily control your tone on stage. 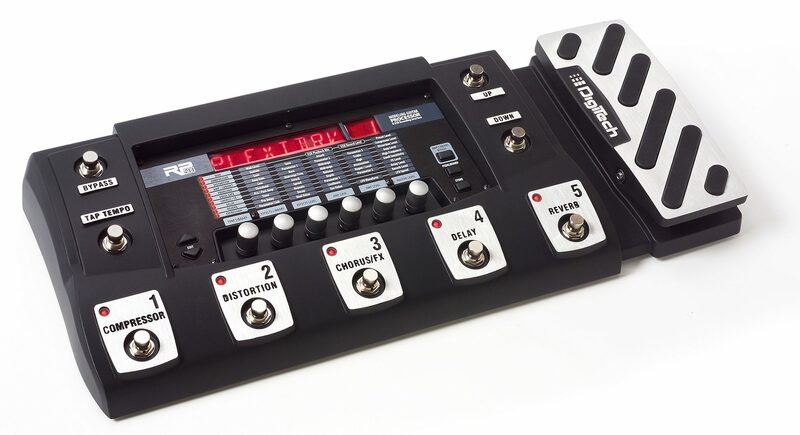 The DigiTech RP500 guitar multi-effect processor gives you the ability to control program changes, complete signal chains and allows you to turn all amplifier and cabinet sounds off in the exclusive Pedalboard mode. When in Pedalboard mode the RP500 acts like 5 separate stompboxes and effects. Save each combo in a preset for a uniquely switchable pedal setup not found anywhere else but pro rigs. The DigiTech RP500 takes the complexity of an effect switching system and combines it with the simplicity of stompboxes. Full arsenals of tones are at your disposal, all easily controlled. If you're a player who takes command of their tone by turning individual pedals on and off, enable the Pedalboard Mode button and instantly use the 5 footswitches to turn the RP500's stompboxes and effects on and off within a program. If you are tired with the effect tap-dance and want to concentrate on playing, the DigiTech RP500's Preset Mode gives you instant access to 5 totally different sounds with the single press of a footswitch (100 presets total across 20 different banks). Now the RP500 features a 20-second looper. Simply play, loop, change tones then overdub. It's that easy. No matter how you like to control your sound, the DigiTech RP500 has a solution for you. Every guitar player is different from their core tone, how they achieve it, and how they control it on stage. Whether you get your tone from your amp and just need a few effects or get your tone from a single box the DigiTech RP500 has the sounds and control over them that you need. Unlike multi-effects that take over your tone and limit your control, the RP500 is an effect switching system over internal stompboxes, effects, and amps. Control your tones in Preset or Pedalboard mode. The Preset mode allows you to switch between saved presets and can drastically differ from one to another. The RP500's Pedalboard mode allows you to turn on an off individual effects and stompboxes with ease within a preset. To top it off, the unique Amp/Cabinet Bypass mode defeats internal amplifiers and cabinets in the DigiTech RP500 leaving you with just stompboxes and effects. Your RP500 is now the perfect collection of stompboxes and effects with unprecedented control to use with your distorted or clean amplifier. Augment and spice up your sound any way you'd like and retain the control you need with the DigiTech RP500. As a traveling worship leader, sometimes I don't have the space to set up a huge amp rig. In comes with the RP500 with its amp modeling effects. With 53 amps to choose from and 22 cabinets, the options are limitless as to what kind of sound you can achieve. Built like a tank, the RP500 boasts both XLR and 1/4" stereo output jacks, so you can plug it in to whatever kind of sound system you are working with. The RP500 lets you switch seamlessly between different kinds of effects -- something you can definitely work with in a live setting. It's ideal for the person who is constantly on the go and does not have the luxury of being able to lug around their own amp rig -- or for anyone who needs the versatility of multiple amp modeling effects. For me personally, the RP500 is especially helpful for church events where the sound engineer prefers there to not be any stage volume. I can plug my RP500 directly into the venue's sound system. "Great sound for the studio. Not impressed when playing live." 23 of 25 people (92%) found this review helpful. Did you? "WOW!! AWESOME, THIS WILL BLOW ALL MULT-EFFECTS AWAY"
27 of 30 people (90%) found this review helpful. Did you?